We are going to leave Alexander Hamilton on the United States ten-dollar ($10) bill, messing only with the back (reverse) of it and changing the face (obverse) of the twenty-dollar bill instead. How many of you even knew that Alexander Hamilton has been on the $10 paper American currency? Yes, since 1928. But enough about this one of only three non-Presidents to be on a publicly circulating United States paper currency, made popular by the hit hip-hop musical Hamilton. Did you know Andrew Jackson was on the $10 bill at one point in time? His portrait was put on it in 1914. When it was replaced by Hamilton in 1928, it was moved to the $20 bill (ousting Grover Cleveland's viz). And now, the poor guy is going to be ousted by Harriet Tubman, being relegated to the reverse side (well, at least he's still on a bill -- whatever happened to Mr Cleveland, the only president with two non-consecutive terms?). Many are happy that Jackson is being ousted, because he was a slaveholder and a racist because of his role in enforcement of the Indian Removal Act of 1830 and non-enforcement of the Supreme Court ruling in Worcester v Georgia in favor of the Cherokees' claim in Georgia. The practically forced removal of the Cherokees from their ancestral lands became known as the Trail of Tears. Some people have even called the forced marches in which hundreds of thousands of people of different tribes died as ethnic cleansing. One has to believe that the President was operating between a rock and a hard spot from a weak position as the leader of a very new nation facing those strong states'-rights-Second-Amendment militia. Also, Martin Van Buren was in office before the really bad incidences in 1838 occurred. Mind, I am not saying that the Trail of Tears as well as many forced relocations before then were not awful and somewhat unfair if not illegal, but it is always easier to know in hindsight what should have happened. As for being a slaveholder... I become annoyed with people today wanting to rewrite history to condemn men who might have been jerks, but were very much like their fellow law-abiding Americans. Slavery was legal then in many states, even northern ones and Jackson was born somewhere in the vague border between North and South Carolina! It would have taken a very brave and very enlightened father or grandfather or extreme poverty in those times to result in someone like Jackson never to have had black slaves. Susan B Anthony starred in a bomb of a coin. All most Americans knew at the time of its issuance was that it was a $1 coin which one might have the misfortune of receiving many in change from the post office lobby's stamp vending machine. 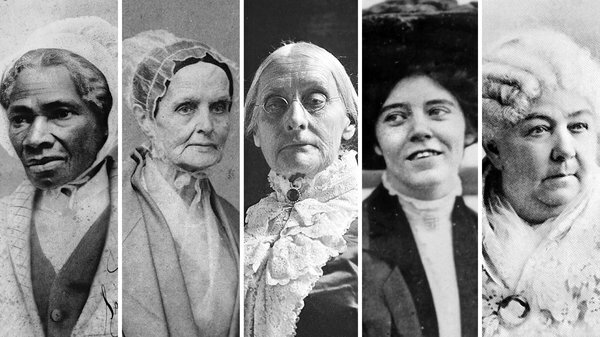 I myself do not know much about Lucretia Mott and only learned of Alice Paul recently (thank a google doodle). Last Saturday, a number of male customers were discussing the plight of history in the United States, that even teachers did not know who Herbert Hoover or George Patton were. Just wait when they start talking about Sojourner Truth and Elizabeth Cady Stanton. I know I learned about them in school. Did you?